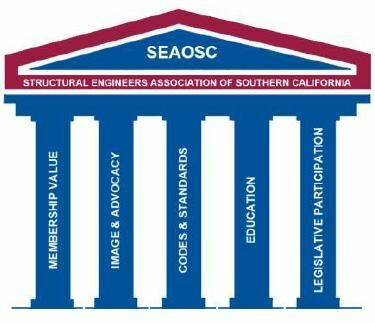 The Structural Engineers Association of Southern California (SEAOSC) is the premier professional organization to which local Structural Engineers belong. The organization serves its members in the noble profession of structural engineering by fostering and promoting the contributions of structural engineers to society. Cultivate social contacts and encourage camaraderie among members. Increase participation by providing worthwhile events and opportunities that bring value to the membership. Promote the professional practice of structural engineering to the community. Enhance the image of the structural engineering profession by implementing an aggressive and proactive public relations campaign that includes advertisements and community outreach. Properly represent the local structural engineers to other state and national professional organizations. Enhance the code and standard development process with effective committee work and cooperation with our partners in the process. Lead applied research efforts to enhance the practice of structural engineering in Southern California and elsewhere. Contribute to the development of structural engineering technologies. Offer world class and state of the art educational opportunities. Provide synergistic learning opportunities among our members on topics of interest. Create policies and guidelines that represent the interests of our members to local and state legislative bodies and representatives. Provide forthright support to local jurisdictions as needed to enact local mandates and code amendments.